The appearance of pumpkins and squashes traditionally heralds the onset of autumn. The bright yellow flesh of squash is a clear indication that it is a good source of betacarotene, an antioxidant that is converted into vitamin A in the body and helps strengthen immunity as well as being good for eyesight. 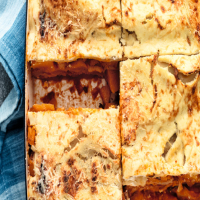 This lasagne has a lovely crusty moussaka-style topping made from ricotta. It can be swapped for ½ x 525g jar essential Waitrose white lasagne sauce, if preferred. 1. Spray a large pan with olive oil and cook the onion, garlic, pancetta and sage for 5 minutes, until the onions are softened. Add the squash, tomatoes and stock, cover tightly and simmer for 20 minutes, until the squash is tender. 2. Meanwhile, in a medium bowl, beat together the ricotta, egg, milk and 1 tbsp parmigiano reggiano. 3. Preheat the oven to 190°C, gas mark 5. Spoon one-third of the squash sauce into a large baking dish (about 23cm x 30cm) and cover with a layer of pasta sheets. Repeat the process until you have three layers of pasta. Spread the ricotta mixture over the top and sprinkle with the remaining parmigiano reggiano. 4. Sit the dish on a baking tray and cook in the oven for 40 minutes, until the pasta is tender. Cover with foil towards the end, once the top is golden brown. Allow to sit for a few minutes before serving.